It’s that time of year again. Caps and gowns are being dusted down and pencils are being sharpened for those final assignments. There’s just enough time for you to find the perfect gift for your high-flying graduate! But what do you give someone who seems to have everything? 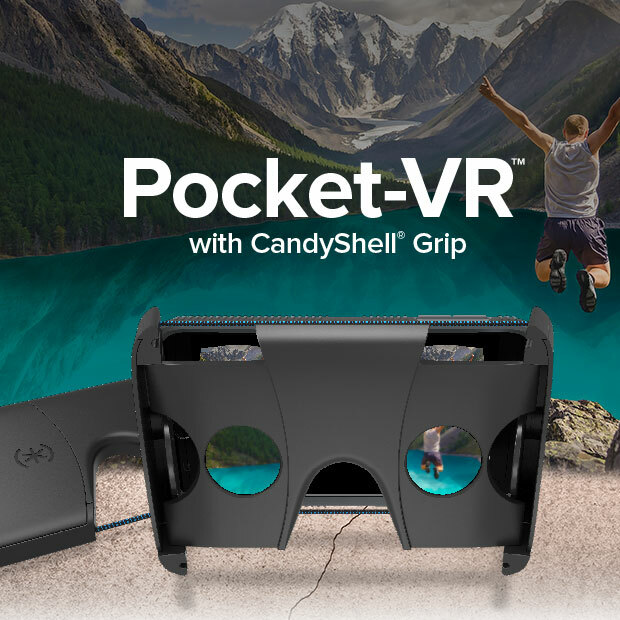 Check out our new virtual reality viewer – Pocket-VR with CandyShell Grip. Long gone are the days of waiting in a line outside the IMAX, 3D glasses in hand or being weighed down by a heavy and cumbersome personal VR device! You can now experience the amazing world of virtual reality from your pocket with Pocket-VR. Your grad will love how compact and portable Pocket-VR is. Its precision crafted lenses immerse you in the action and when you’re done; you can conveniently fold them away and slip them in a pocket. Plus there’s no need to worry about damage to Pocket-VR or your device. Not only do retractable side panels shield the lenses from dust and scratches, the Pocket-VR comes with our military-protective CandyShell Grip phone case. As well as being slim and durable, raised rubber ridges provide a secure, non-slip grip, making CandyShell Grip the perfect companion to experience Pocket-VR. When it comes to content, Pocket-VR with CandyShell Grip VR viewer is a “Works with Google Cardboard” certified viewer. So your grad can enjoy a premium experience between his/her new VR viewer and the latest Cardboard apps. On top of that, we’ve partnered with Jaunt, an industry-leading provider of virtual reality content, which provides access to some of the most exciting virtual reality adventures available. Stand out from the crowd and give your grad a ticket to somewhere amazing with Pocket-VR with CandyShell Grip. There is no other iPhone 6/6s VR viewer or Samsung Galaxy S7 VR viewer quite like it. Discover Pocket-VR with CandyShell Grip today.